In this newsletter, we are going to talk about journalistic focus and the way newspapers have been covering the latest Facebook scandal. First of all, there are obvious and very serious issues with how Facebook works, but, as a media analyst, my role is to talk about the media. And what I am seeing right now is a destruction of trust, and not in how people think about the tech companies, but in how people feel about journalism. So, we need to talk about this. First, though, I like to point out two articles I posted over the past week that touch on this subject in very different ways. In this article, I illustrate why we are missing the point about Facebook vs. Cambridge Analytica, and why we need to have a discussion about three other things instead: Political corruption, 3rd party sharing, and the overall trend around privacy. In this 39-page article, I go through some of the more significant issues that are currently causing a problem with trust in media. I started working on this article before the whole FB CA scandal, so this takes a much broader view on the issue. But if you want to learn about how to think about trust in the media, I highly recommend that you read this one. Now, let's get back to what I started talking about. Why is the media industry harming itself with its Facebook coverage? Well, it's because we don't do it honestly. One of the main reasons why I became a media analyst is because of the role that we have in society. We provide the public with something that the public cannot provide for itself. We protect the public from those in power who aren't living up to their responsibilities, and we keep everything in check. This is an awesome role, and it's a role worth dedicating your career to. And the public also recognizes this role in the way that the media is granted a set of 'entitlements' that other people don't have. For instance, the media is offered 'freedom of the press'. We are provided with greater access; we are invited to press events that aren't open to the public, and the politicians in power feel a much stronger urge to answer our questions. I'm not saying the politicians like it, but we definitely have better access. Also, journalists and media companies are provided with much greater leeway in legal matters. The courts provide us with much greater flexibility, and the rare case of a fine is often much lower. We can protect our sources, even when a source has clearly committed a crime. We have greater flexibility in reporting private information and many other things. And on top of all of this, the media is often provided with financial benefits. These come in three different ways. One is tax-breaks, where a publisher has to pay lower taxes or VAT rates (or even none at all). The second one comes in the form of government subsidization. And the third one comes in the form of assured advertising, where government legislation dictates that local governments have to buy ad space in local newspapers when they want to announce something to the public. Obviously, different countries implement this in different ways, but the concept is the same. The public has granted the media a significant set of entitlements. So what must we provide in return? Well, the answer is that we must, in turn, provide ethical and objective journalism. Or to put in even simpler terms. We cannot use our entitlements for our own benefit. For instance, you cannot use your journalism to drive a political agenda, you cannot use it to help one type of company while harming another, you cannot use it to benefit a friend or a business partner ... and just as importantly, you cannot use it to harm your competitors. Obviously, there is no such thing as truly objective journalism, but look at how we have violated our role over the past ten years. It started with political coverage, where several high-profile media companies have turned into fully fledged political propaganda machines. But the political stuff, while being a big problem in isolation, isn't a problem for the news media industry as a whole, because only a few media sites are doing it. This, however, is where we need to talk about how the media has been covering Facebook and Google. There is no doubt that Facebook and Google are massively disrupting the old world of media and, because of this, are your competitors. There is also no doubt that there several issues within both companies that are bad. Problems with privacy, problems with how their platforms are used by extremists, problems with algorithms and other things. However, this is where the importance of objective journalism comes into play. Because while there are grounds to report on the latter, you cannot use your writing to lobby against a competitor. You cannot use your special entitlement to drive a business agenda of your own. So what is the media doing? Well, over the past week, we have seen some of the worst media lobbyism ever. Google earns billions and attracts Nazis and pedophiles. Facebook knew their data could be sold and made no secret of it. Here is all the data Facebook and Google have about you ...where we 'forget' to distinguish between actual privacy-related data and data that people have willingly uploaded (like when someone posts a picture). These are the big advertisers who still advertise on Facebook. These are the companies who still advertise on YouTube. This big company says that it will still advertise on Facebook, here is another scandal that makes that company look bad. What we are seeing here is not journalism. Just the point that so many newspapers have been calling for people to 'delete their Facebook accounts' illustrate a total breakdown of any sense of journalistic objectivity. This is not about journalism anymore. This is 100% pure 'media war' between news media losing their market share on one side, and the tech companies on the other. And, on top of this, several of the larger newspapers have been inviting 'opinionists' to write anti-Facebook or anti-google articles in their editorial sections. This way, the newspapers can claim that they aren't the ones doing this. They will say that the newsroom does not write the opinion section. But you are still inviting it, you are still promoting it, featuring it on social channels, and you are still placing in on your front pages. And more to the point, every opinion article has the same anti-Facebook views. Remember what I said in the beginning. As journalists, we are granted a set of entitlements because of our role in society. But, when we do something like this, we violate the responsibility that comes with this in the most profound way possible. Imagine, for instance, if Facebook started doing the same thing. 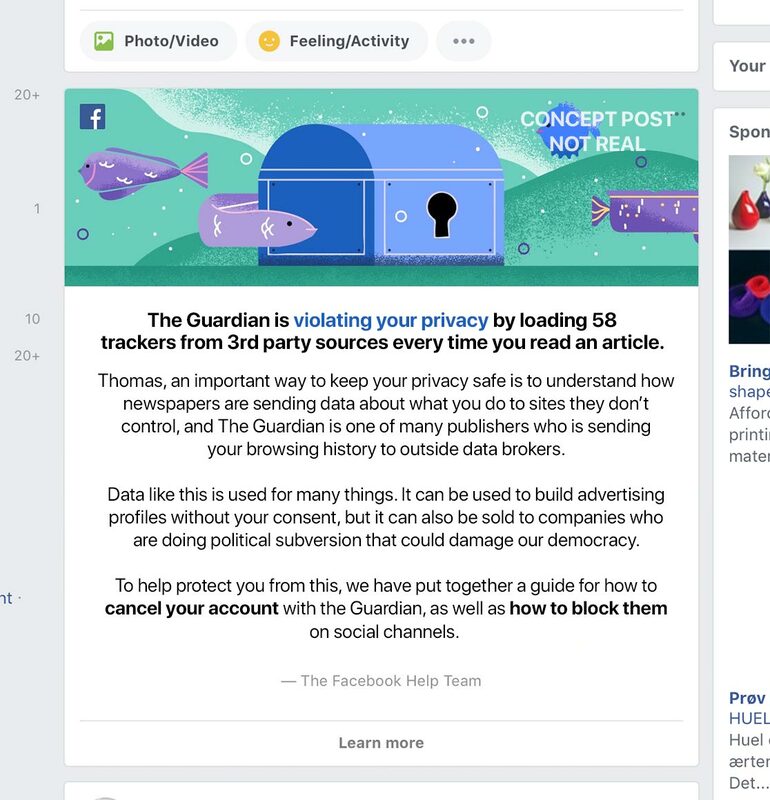 Imagine if they started using their News Feed and their power, to highlight and point out privacy violations by publishers. Can you imagine just how absolutely bananas people in the media would go if Facebook did this? But this is what we have been doing in the media. And it has to stop. There is a huge difference between reporting something as journalists and using your influence and entitlements to drive an anti-competitor message. Don't get me wrong. As I wrote in the article I linked to above, there are genuine issues to discuss, but this is not how to do it. And then we see stories like this one from Axios: "Media vs. Facebook: This time it's personal". Facebook and Google execs privately complain about the barrage of critical coverage they face, charging that media companies have a financial incentive to attack them and that media execs are settling scores. They're right. The reactions I have seen on Twitter to this is outright scary. I have seen journalists and editors argue that this is not true, and making the counter-point that the media has just been 'too soft' on Facebook. Are you kidding me? There has been a constant barrage of negative stories about Facebook and Google for years. Journalists are abandoning their objective focus. Instead, they are just reacting with their feelings and outrage, not thinking about this story in a journalistic sense, but, instead, how they feel about it as people. And this brings me back to where we started. Why am I saying that this is causing more damage to the media industry than it is to Facebook or Google? The answer is simple. It's because people aren't stupid. People can very clearly see that the way this story is being reported is so filled with animosity that it isn't real journalism. And, as a result, we see two trends. One is an increasingly polarized audience, where people are reading newspapers based on how they feel. We see how subscriber growth is driven by outrage instead of by objective journalism. The other trend is an increasing level of anti-media sentiment by people who are calling out newspapers for their lack of objectivity, and their own misuse of data. When you combine these trends, you see how we are losing the concept of journalism. Remember what I said before when I defined journalism? We provide the public with something that the public cannot provide for itself. What the public can do by itself is to discuss issues in the form of 'what they feel' about something. This is what we see when people post about something on Twitter, or when they create a YouTube video about it. People express their feelings. But what the public is unable to do, is to take that step back and look at the bigger issues, to compare them to other factors, and to check the data. In other words, we (the media) are the place that people can turn to when the public has lost their objectiveness. This is why we exist. Newspapers should be the place that people turn to when they are tired of just listening to people expressing their personal opinions. But we are losing this role. Today, I see newspapers increase their use of 'opinion' pieces as a way to drive even more traffic. I see more and more examples of journalists and editors who are increasingly focusing on stories based on their own opinions, whether it's their opinions about Facebook, other elements of tech, or some other issues. Again, there are important issues to discuss about all of these, but we have to do it as journalists. And we are losing this vital distinction. To me, journalism is defined in two ways. One is by the responsibility that our 'role' creates, which is that we cannot use journalism for our own gain. The other is by our objectivity, as Merriam-Webster describes it: "Expressing or dealing with facts or conditions as perceived without distortion by personal feelings, prejudices, or interpretations." This is a different role than what we had in the past because, back then, we also had the role of being the bringers of information. But today, the internet provides all the space that people need to express their own opinions, so we don't need journalists to create even more of them. So, let's dial down the outrage and the lobbyism, and let's bring back what it really means to be a journalist.